In 1972 Arthur and Vivian Weber bought twenty-one acres in the Dundee Hills from Jim Maresh (see Maresh Vineyards). The land had panoramic views of the Willamette Valley, the Cascade mountains, and was located just off Worden Hill Road not far from the town of Dundee. In 1976 they purchased from neighbor Nita Moyer an additional sixty five acres which included a farmhouse. To their good fortune this land bordered their existing acreage. 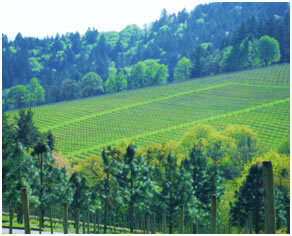 From 1975-1988 the Weber’s planted thirty five acres of Riesling, Chardonnay, Pinot Noir, and some Gewurtzraminer grapes. Over the years grapes were sold to Oak Knoll, Erath Winery, Cameron, Rex Hill and Arterberry Winery. At some point the Weber’s sold about 21 acres of the original vineyard to Andy and Adria Humphreys who were long time vineyard managers. 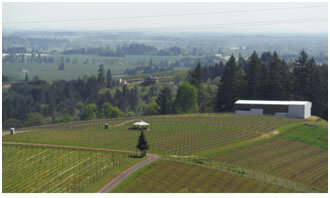 In 2013 the Humphreys resold the acreage to Holloran Vineyard Wines, who has constructed a new winery on the property.